As I reflect on the books that I have reviewed throughout these last months (just shy of 1 year), I find myself struggling not to wallow in depression. I wanted the reviews to inform people of both parties as to what was actually happening in Washington. I hope this would give each of us the impetus to make personal decisions that would support our democracy in the time ahead. It truly has been a depressing compilation of authors’ impressions of this presidency. We have watched, and for some of us participated in marches, tabling events, knocking on doors, etc. 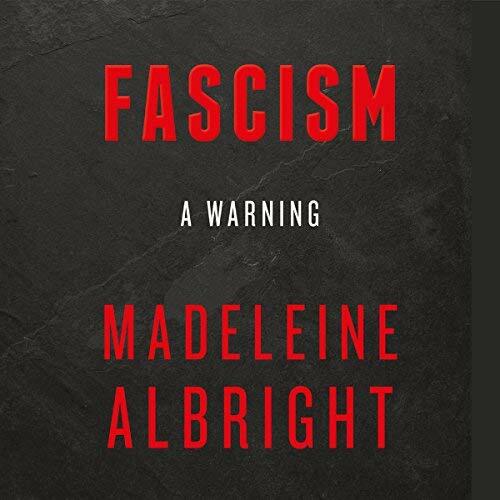 But reading Madeleine Albright’s chronicle of fascism gives all of us a new and frightening foe to combat. Madeleine Albright is especially well prepared to write this book. She draws on her own experience: Born in Czechoslovakia in 1937, she fled the country twice with her family – first to England after the Nazi takeover in 1938 and then, permanently, to the U.S. following the rise of a Communist government in 1948. Following a career as a political staffer and academic, Albright served as former president Bill Clinton’s ambassador to the UN before becoming her country’s top diplomat, Secretary of State. Some of the book’s strongest sections are the ones drawn from Albright’s first-hand observations of the autocrats she dealt with while in office. Talking with her students at Georgetown, there is an attempt to define Fascism. They identify three identifiers. First, fascism flourishes alongside economic, social and political chaos. In these conditions, citizens are susceptible to autocratic leaders who play on their fear and desperation. Chavez’s rise to power was fueled by deteriorating social and economic conditions growing in Venezuela; Viktor Orban came to power as Hungary experienced the fallout of a financial crisis; and Vladimir Putin emerged as Russia was in the midst of economic and national decline. However, in warning, Albright points out that problems only become opportunities for fascists and other antidemocrats if their opponents can’t or won’t address them. Albright’s third warning factor revealed is the connivance of conservatives. In both interwar Italy and Germany, conservatives believed they could control fascism and use its popular support to achieve their own goals. Examples: King Victor Emmanuel III in Italy and Germany’s President Paul von Hindenburg. They were persuaded by conservative advisers to hand power over to Mussolini and Hitler. So where does that leave us today? There are worrying parallels: our democracy faces challenges. Albright hopes antifascists will learn from history. Where she does not go so far as to call President Trump a fascist, she says that Donald Trump is the “first anti-democratic president in modern U.S. History”. She challenges both Republicans and Democrats to work together to solve our country’s problems and not be blind to what this danger to democracy represents. The danger is, “to close our eyes and wait for the worst to pass”.